We’d love your help. 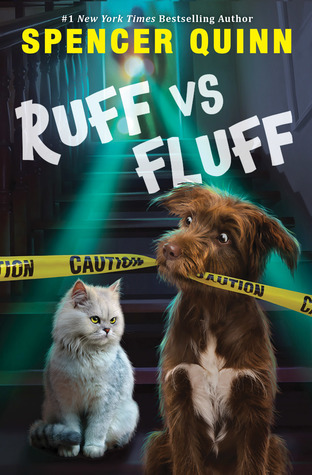 Let us know what’s wrong with this preview of Ruff vs. Fluff by Spencer Quinn. From the outside, Queenie the cat and Arthur the dog appear to have a lot in common. Both pets live in the charming Blackberry Hill inn. They both love their humans, twins Harmony and Bro. They both have a fondness fo New York Times bestseller Spencer Quinn returns with a laugh-out-loud series about the most epic rivalry of our time . . . Arthur the dog vs. Queenie the cat. To ask other readers questions about Ruff vs. Fluff, please sign up. 293 pages. This book is told in alternating chapters by a cat and dog. It seems like it is on a middle school reading level. It was boring to me after reading two chapters. I don’t think elementary kids will get into this one. Cute cover though. Arthur, an enthusiastic but somewhat misguided mixed breed dog, and Queenie, a particular and discerning cat, both live with their humans at the Blackberry Hill Inn, which is near some mountains (in Maine?). Harmony and Bro are the children who play hockey, and Mom runs the bed and breakfast. When a gues, Mr. LeMaire wants to hike the Sokoki Trail, he wants to hire the children's cousin Matty for twice the going rate, but he is busy. Instead, he hires the children, and insists that they return after they get him to the trailhead. When he doesn't return, their mother is concerned until she gets a text that he was called away on business, and that someone will call to pick up his luggage. This seems somewhat suspicious, and when Harmony has a bad day at hockey with a teammate, she takes Arthur on a hike... and discovers LeMaire's body in a cave. Matty is in the area cleaning brush, and the two called sheriff Hunziger and his deputy Carstairs. Hunziger is an idiot, and before long is accusing Matty of the murder. Matty runs off and Arthur takes a bit at Hunziger, prompting his removal by the local animal authorities for a while. There are some odd documents in LeMaire's room, and the woman who picks up his things acts oddly, so Harmony starts investigating. Hunziger is sure that the murder was motivated by a hunt for artifacts, but the evidence suggests more of a connection with moonshine running at the time of Prohibition, and secrets about local families start to surface. Strengths: This is a murder mystery, and my students are ALWAYS asking for murder mysteries. The connection to rum running and Prohibition was fascinating. I also enjoyed Harmony's passion for hockey, and the fact that a teammate who gave her grief was reprimanded by his father and made to apologize was great. Readers who like books from animals' perspective will enjoy Queenie and Arthur's take on things, as well as their love for sausage. The Bowser and Birdie books do well in my library. Weaknesses: I wasn't a fan of Sheriff Hunziger, Bro, and Arthur all be depicted as not very bright. One character, maybe, but this made me suspect something bad in the water. Hunziger is just evil, but Bro sounds like he might need some intervention. Arthur is a bouncing, happy, loves-everyone sort of mutt. He's not too smart, but he's very loyal, loves his family, and has an excellent nose. Queenie is This is a story aimed a younger readers, though its length may conflict with its cat and dog narrators in finding the right audience. 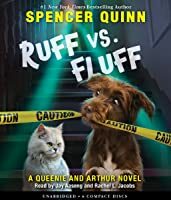 Ruff vs. Fluff is the adventures of Queenie the cat, Arthur the dog, and their humans - Mom and the twins Bro and Harmony. Together they own the Blackberry Hill Inn which is struggling financially. When their sole guest, Mr. Lemaire, ends up dead, and their cousin Matty is blamed, they must unravel the mystery with only an old map and postcard to go on. This is a children's book, and I thoroughly enjoyed it. Ruff vs. Fluff is told from the alternating perspectives of Queenie and Arthur. 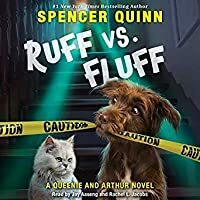 If you ow Ruff vs. Fluff is the adventures of Queenie the cat, Arthur the dog, and their humans - Mom and the twins Bro and Harmony. Together they own the Blackberry Hill Inn which is struggling financially. When their sole guest, Mr. Lemaire, ends up dead, and their cousin Matty is blamed, they must unravel the mystery with only an old map and postcard to go on. Have you seen the movie Homeward Bound? This middle grade mystery is pretty much narrated by Sassy the Cat and Chance the dog. There’s a murder! Kids find a body! Cousin is framed by bumbling cops! Can kids and pets (who hate each other) solve this crime and save beloved cousin? There is an audience for this book — it works like a real mystery story and the animal points of view are fun. But finding a reader for it in my class tricky because the length and text difficulty mean that it’s probably Have you seen the movie Homeward Bound? This middle grade mystery is pretty much narrated by Sassy the Cat and Chance the dog. There’s a murder! Kids find a body! Cousin is framed by bumbling cops! Can kids and pets (who hate each other) solve this crime and save beloved cousin? There is an audience for this book — it works like a real mystery story and the animal points of view are fun. But finding a reader for it in my class tricky because the length and text difficulty mean that it’s probably aimed at a younger advanced reader who still likes pet narrators. I don’t have a ton of readers on grade level, and those who do are not big on cute books or pet narrators. Queenie the cat and Arthur the dog live with their family, a mom and twins Harmony and Bro, who own the Blackberry Hill Inn. In alternating chapters, readers get the points of view of the egotistical and vain cat and the exuberant and not-too-bright dog. When a guest of the inn turns up dead and an incompetent sheriff arrests the wrong man, the cat and dog join the twins in trying to solve the mystery. This is a fun mystery and the cat and dog narrators are wonderfully entertaining. Queenie and Queenie the cat and Arthur the dog live with their family, a mom and twins Harmony and Bro, who own the Blackberry Hill Inn. In alternating chapters, readers get the points of view of the egotistical and vain cat and the exuberant and not-too-bright dog. When a guest of the inn turns up dead and an incompetent sheriff arrests the wrong man, the cat and dog join the twins in trying to solve the mystery. This is a fun mystery and the cat and dog narrators are wonderfully entertaining. Queenie and Arthur’s personalities shine through in their narration. Readers will be left hoping there are more mysteries to come. I love both the Chet and Bernie (adult) series and the Bowser and Birdie (middle school) series but I didn't like this one as much. It was entertaining but had too many stereotypes: Queenie, the cat, was aloof and vain; Arthur, the dog, was goofy and dumb; the sheriff was fat and lazy; and the villians were simply greedy and sly. Quinn typically writes much better than this. I enjoyed this book thoroughly. It is funny and Queenie and Arthur's personalities are so different. In the end, I couldn't put the book down because of the suspense! The reason why I gave this book only four stars is because the first 50 pages, I thought, were a bit hard to follow. Stick with it though! Another great series. The ending gets tidied up pretty fast (& raises a question or two), but a fun beginning to a new series told by a dog and a cat. Creative and enjoyable. Already looking forward to book #2! As a Scholastic Insider I was given an advanced copy of this book to preview for my 4th grade students and it was a lot of fun to read! I loved the cat vs dog point of view and look forward to sharing the book with my students who love mysteries. It’s funny enough but it’s also basic. I was expecting something along the lines of Chet and Bernie, and didn’t realize this was a middle grade mystery. I wish I’d paid more attention to the description rather than looking at the evil expression on the cat’s face. While I bought this book intending it for my third grade grandson I enjoyed it immensely! I love that the vocabulary was not watered down but that also means younger children might have a little trouble with it. Can't wait to hear what my grandson thinks about it. This is a cute mystery in a new series for young readers. The cat Queenie and the dog Arthur alternate as narrators.